Traces of Omnipresence is curated by Leslie Kerby and features work by I-Hseun Chen, Ryan Sarah Murphy and Eleanor Ray. The exhibition is open from February 6 - March 29, 2013. A closing reception will be held Thursday, March 28, 6:30-8:30pm at the gallery located at 156 Fifth Avenue, Suite 308, Manhattan. Regular open hours are 11am-6pm Monday through Friday. This February, EFA Artist, Scott Teplin will teach a six-session course at RBPMW on how to bind an extremely durable, archival book that lies flat for scanning or copying. In addition - Teplin will give a talk on his work at the RBPMW on Feb. 7 at 6:30 pm. Free and open to the public. Yasuyo Tanaka's print, "all things are linked 311" was selected by the International Print Center for New Prints 2013/Winter. This show runs from Jan. 18 – Mar. 9, 2013. The opening reception is on Thurs. Jan. 17th, 6-8pm. 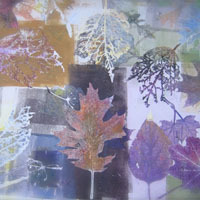 Robert Blackburn printmaker Mary Walker is one of five artists chosen for the Print Club of New York's 2012 Showcase on December 4. Michael Krueger is currently exhibiting at Des Lee Gallery until November 17th. The show, Nowhere Backwards, responds to the question "How do human beings fit into landscape?" and "How do we begin to tell the long and varied story of man and nature's delicately interconnected history?" Yasuyo Tanaka will be featured exhibition, part of the Asian American Arts Alliance's citywide Locating the Sacred Festival. The exhibition "Interpreting Rituals: The Butterfly Effect" will be at New York Art Residency & Studios Foundation. Fourteen collages from my series Border Lines will be exhibited in St. John's Hall at St. John's University in Queens, NY from September 7-21, 2012. The collages combine litho transfer, etching and gouache and were created at Blackburn printmaking workshop and at a residency at VCCA (Virginia Center for the Creative Arts). Yasuyo Tanaka received 2012 scholarship from Manhattan Graphics Center. She will have Artist Talk on July 21 Saturday at 7 pm 250 W 40 St. 5FL New York City. She also will teach Summer Ink program. EFA Studio Member Hilda Shen will show both porcelain sculpture and monotypes (created at the Robert Blackburn Printmaking Workshop) in a three-person exhibition at Parallel Art Space. The show runs from July 14-August 12, with opening on Saturday, July 14, 6-9. Pete Williams in an exhibition that marks the culmination of work which he began during a three month residency at Aberystwyth Arts Centre. Marian MacDowell in front of Edward's log cabin, the Colony's prototype studio.Jim Gaylord is currently a fellow at the MacDowell Colony in Peterborough, NH. Founded in 1907, MacDowell is the oldest artists' colony in the United States. Judy Negron's mosaic, "Muses" has been selected for The Prince Street Gallery Invitational, juried by Yvonne Jacquette. The show is on from June 19th to July 7th, opening Saturday June 23rd, 3-6 pm. 530 West 25th St, 4th floor. The gallery hours are Tuesday-Saturday, 11-6. 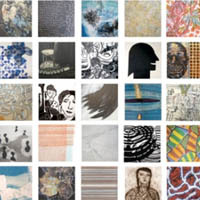 June 15 - August 11, 2012 A national portrait exhibition curated by gallery Director Sergio Gomez explores the "other" behind our social media face. Artists and VCCA fellows Leslie Kerby and Christopher Preissing have collaborated on a sound and text piece for the exhibition entitled "Leaves of Tweet." EFA RBPMW member Michael Krueger's exhibition "Every Which Way But Loose - New Prints" is on view at Blackburn 20|20 at EFA on the 5th floor, May 3 to May 31, 2012.